Fashion Polish: Polished by KPT March into Spring collection review! 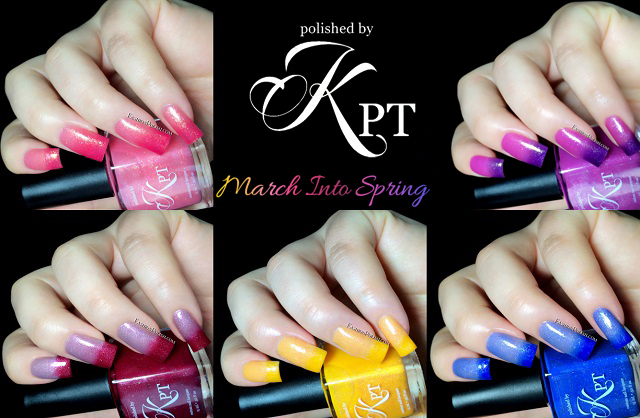 Polished by KPT March into Spring collection review! I have a very colorful collection to show you today from an indie brand I love : Polished by KPT! The March Into Spring is a set of 5 bright thermal shimmers with nice coverage and application. I used 3 thin coats plus topcoat in all of my swatches. "This thermal polish is inspired by the beautiful pink color of cherry blossom. When cold, it is a vibrant cerise color and transition to a pink coral when warm. This polish is filled with gold shimmers, pink and purple flakes and iridescent glitters." Blossoming is a gorgeous coral pink. The "fading" thermal effect and extra shimmers/flakies make it a very unique polish. I'm not a pink person but I loved it, so pretty and delicate! "This gorgeous thermal polish was inspired by the ranunculus flower colors in a cranberry red (cold state) and transition to a mauve (warm state) filled with green micro flakes, pink & red shimmers." Don't Be Ranunculus is the polished that surprised me the most! I didn't expect the greyed out mauve color in the warm state but it's a really fun and unique combination! "This thermal polish when cold it is a beautiful lavender color and transition to pink when warm that is jammed packed with micro green and purple flakes." The color change in Love in Bloom is pretty drastic! For a purple lover, it's mesmerizing! "This thermal polish is inspired by the vibrant blue and purple color of the hyacinth flower. When cold, it is a sapphire blue and when warm it transitioned to light amethyst color. The polish is filled with green and purple flakes and micro holographic glitters." I failed miserably at showing you the true beauty of Hyacinth... The mix of shimmers / micro glitters and flakies make it a one of kind, absolutely breathtaking! If you love blue, you NEED it!!! "A vibrant and fun thermal polish color inspired by the peach fruit and the sunshine. When cold, it is a bright yellowish orange color and transition to a shimmery peach when warm. In different angle or indirect light, you can catch the micro green glitters." Let's Get Peachy! is the most subtle thermal of the collection but also the most vibrant. I didn't really know what to expect in terms of application, yellows can be so troublesome, but it actually looked just as good as the other ones with 3 thin coats. The Polished by KPT March into Spring collection can be purchased on polishedbykpt.com (US) and retails for $12 each. Make sure to visit this page for a full list of stockists in your country and to subscribe to the newsletter to be informed on new releases, promotions and restocks. So what do you think about this collection? Have you ever tried thermals?